Well, we think they are unusual. We hope you haven’t heard them all. Mix all the ingredients together in an empty glass jar or dish then drizzle over your favourite fresh salad and enjoy the soothing herbaceous flavour of lavender! It can be used, combined with other ingredients, as part of an after-sun treatment, but don’t put the oil directly on your skin. You could add it to your Potpourri. Potpourri is a mix of natural, dried material which gives off its own fragrance, but this can dull after time. Adding Lavender will reinvigorate it. Lavender water can be made and used as a room freshener. Carpet cleaner, a bit like Shake and Vac you can mix the Lavender oil with baking soda, sprinkle over your carpet, leave it on for a bit and then vacuum. Be careful of pets and young children when doing this. 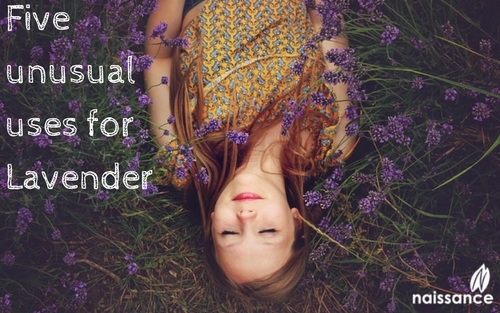 What uses have you found for Lavender Essential Oil? We would love to hear some more unusual ways you have worked with Lavender Essential Oil. Coming up Tomorrow… What do you think the Soil Association logo means? It is becoming an increasingly recognised logo on organically certified products but just what inspired the design? Naissance Staff Top Aromatherapy Picks Part 2 - We continue with our staff suggestions for their favourite aromatherapy oils. Part 1 was posted on Tuesday 13.09.16.